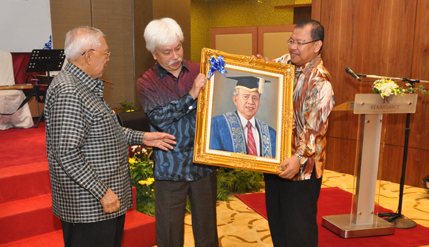 KUALA LUMPUR, Aug 16, 2014 – The National University Of Malaysia (UKM) tonight feted Tengku Tan Sri Ahmad Rithaudeen Tengku Ismail at a dinner party in appreciation of his distinguished service as pro-Chancellor for 22 years, the longest thus far for the post. The 85 year-old relinquished the position earlier this year and donated a collection of his legal books to the university’s Law library. In a brief speech at the dinner, Tengku Rithauddeen said he longed for a time like his childhood when there was genuine camaraderie among the pupils of all races. “At that time, it does not matter whether you are Malay, Chinese or Indian, we were all friends. I hope in the future my grandchildren can enjoy such an environment,” he said. Tengku Rithauddeen said he ventured into law because since his school days he was told that lawyers and legislators would be required when the country gained independence. UKM Chancellor and the Yang Di-Pertuan Besar Negeri Sembilan Tuanku Muhriz Tuanku Munawir and his consort Tunku Besar Negeri Sembilan Tuanku Ampuan Aishah Rohani Tengku Besar Mahmud along with Pro-Chancellor, Tunku Panglima Besar Kedah Dato’ Seri Diraja Tan Sri Tunku Puteri Intan Safinaz Binti Tuanku Sultan Abdul Halim Mu’adzam Shah, attended the ceremony. Among the others who attended were UKM Board of directors Chairman Prof Emeritus Dato’ Dr Mohamad Zawawi Ismail, Vice Chancellor Prof Datuk Dr Noor Azlan Ghazali, all the four Deputy Vice-Chancellors and former Vice Chancellor Prof Tan Sri Dr Sharifah Hafsah Shahabudin. Tengku Ahmad Rithaudeen served in various capacities as a barrister in his law firm, in the government, a member of Parliment in the Dewan Rakyat, a minister in the cabinet and lately as chairman of the UMNO disciplinary committee. He was born in 1929 not in 1932 as stated in the official records. Now 85 years old, he was always known for speaking fluent English which he mastered at the urging of his father. Often called the ‘gentleman politician’, Tengku Rithauddeen wanted to fulfill his dream of becoming a famous barrister or prosecutor or judge, before entering politics and holding the position of chief information officer of Kelantan Umno. He then contested in the general elections and won the Kota Baharu parliamentary seat.